A couple of weeks ago I’ve put Zignals under my Experts category as most of you will probably have seen by now. 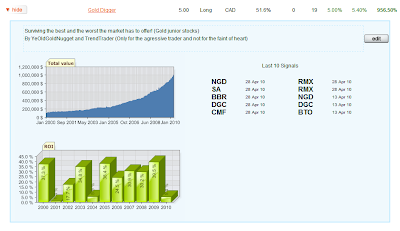 Some time has passed since early April and YeOldGoldNugget and Trendtrader are always working and improving our trading skills and getting the most out of the market. These last few weeks saw the birth of 5 new strategies which not only were profitable, they also withstood the test of time as to being able to be profitable during the Good, the Bad and the Ugly and thus back-tested all the way back to early 2000. I will briefly explain each new strategy so you know what to expect. The Oil Guzzler strategy follows Brent Crude oil and limits itself into generating that large of a number of signals, so expect on average a maximum of 2 per month. 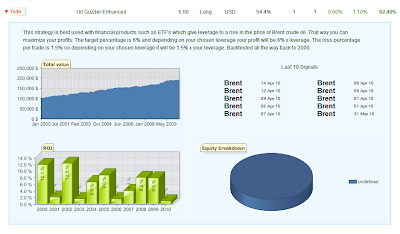 The idea of Oil Guzzler is to use this with other financial products which give leverage to a rise in the price of Brent Crude oil. The Enhanced version is the more aggressive one as to the amount of investment per trade but you can always choose your own maximum limit. The strategy works the same either which way you decide to go. The maximum profit per trade is 12% and the maximum loss per trade is 1.5%, give or take a few percent depending on when you can exit the trade. This strategy holds the winners and ditches the losers so the average holding days of winners stands at 14 days while the holding days of losers stands at 4 days. This is all about making that money work for you and thus not creating dead money which gets stuck in a losing trade. Not for the faint of heart indeed is where I would start with this strategy. If you are an aggressive trader then this is right up your alley, your cup of tea and just what the doctor ordered! A strategy which also has been back tested all the way back from the dot.com boom all the way through to where we are now. The strategy isn’t called gold digger just for the fun of it,…this will scrape the barrel of what some would call getting the most out of those profits. The investment per trade is not advised for the regular investor so if you subscribe I strongly advise you to use your own limit. The stock pool holds 19 selected gold juniors. On average you can expect a maximum of 6 trades every month with this strategy. Wishing all Prosperity and Good Luck. ← Volta Resources Inc. again in Prime Position!